Corpse Fleas are territorial graveyard and tomb vermin that feed on corpses and bones. They look much like giant 3' long fleas, with strong back legs (indeed they can leap up to 30') and large serrated forelimbs. 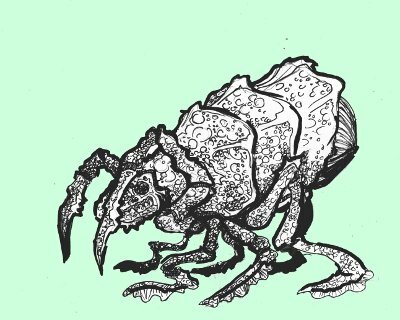 Corpse Fleas are pale creatures with disgusting fluids and strange organs visible through their mottled chitin. Flea heads are long and equipped with both serrated mandibles and sharp proboscis that inject those they hit with a disorienting venom. Special Attack: The disorienting venom of a corpse flea makes those who have been injected with it unsteady on their feet and sluggish in thought and action. If a save vs. poison is not made, the victim will suffer a -1 to hit for 1D6 turns before the flea poison runs its course. Multiple injections of flea poison have an additive effect, with a maximum penalty of -3 to hit. One of the more notable traits of corpse fleas is there strange means of reproduction. Any flea may inject tiny larva into the bloodstream of a living or recently deceased (still warm) humanoid. The larva can swim about happily in a living creatures bloodstream for years causing no ill effects, but upon death, they will being to devour the body from within. In 2D6 days 1D6 corpse-fleas will burst from the chest of the corpse and begin looking for food.